Egypt's President appeals to the United States to play a greater role in helping his country fight terrorism. Egyptian President Abdel Fattah al-Sisi on Monday appealed to the United States to play a greater role in helping his country fight terrorism, as he urged the creation of an "Arab ready force" to confront the Islamic State (ISIS) and similar groups. Speaking in an exclusive interview with Fox News, al-Sisi addressed the need for what he called a religious "revolution," urging moderate Muslims around the world to "stand up" against terrorists twisting their religion. In the short term, he said, more military might and funding will be needed to confront the extremist threat and questioned whether the U.S. was doing enough for Egypt. The Egyptian President said that while the U.S. has helped Egypt for decades, Egypt needs that help "more than ever," and wants to see a "big response from capable countries." He said the suspension of American equipment and arms to his country has sent a "negative indication to the public opinion that the United States is not standing by the Egyptians." The United States announced in late 2013 it would cut hundreds of millions of dollars in aid to Egypt, citing its displeasure with the military's pace of restoring democracy following the ouster of former Islamis President Mohammed Morsi. American law forbids sending aid to countries where a democratic government was deposed by a military coup, though Washington has never qualified Morsi’s ouster as a "coup" and has been cautious about doing so, choosing only to condemn the violence in the country. Last year, then-Defense Secretary Chuck Hagel confirmed the United States would deliver 10 Apache helicopters to Egypt meant to support Cairo's counter-terrorism efforts. Those helicopters were indeed delivered in December. Al-Sisi told Fox News the need for weapons and equipment remains "dire," and Egyptians "would like to feel that the United States is standing by them." Asked directly how he and other Arab allies view U.S. leadership in the region, he answered briefly in English, "Difficult questions." He also addressed his country's campaign against terrorism weeks after the Islamic State released a video showing 21 Egyptian Christians being beheaded. That video triggered Egyptian airstrikes on ISIS targets in Libya -- airstrikes that, according to the Pentagon, the Egyptians did not notify the U.S. of in advance. At the time, even the top Pentagon spokesman acknowledged the U.S. and Egypt have a "complex relationship." While Egypt is not currently launching airstrikes alongside the U.S. and other Arab nations in Iraq and Syria, al-Sisi endorsed the idea of an "Arab ready force" with U.S. backing to take on security challenges. He said this "ready force" could include his country, Saudi Arabia, the United Arab Emirates, Kuwait, Jordan and others, and be "capable of defending our national security" and confronting dangers in the region. 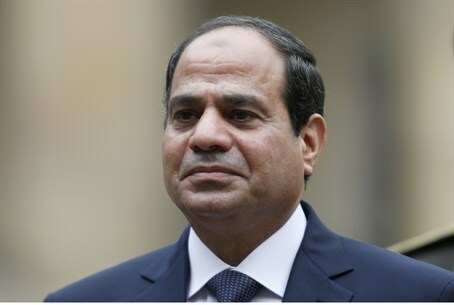 "We have to admit that terrorism is now a major threat not only to Egypt or even the immediate region, but it is a threat to the stability and security of the whole world," al-Sisi told Fox News. "We can also see that the map of terrorism and extremism is expanding, it is not recessing." He also said it's important to push to "reinstate the right meaning of religion." Addressing the role of the Muslim Brotherhood in his country, he spoke out against what he described as "political Islam." He said the people of Egypt have a "real fear of this kind" of system, adding they feel "these people have turned their lives into a living hell."